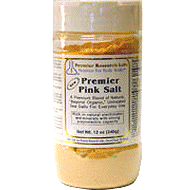 Premier Pink Sea Salt from Premier Research Labs is an organic, raw sea salt for everyday table and cooking use. This untreated sea salt is from ancient, unpolluted sea beds. Unlike commercial salts, which are highly heated, damaging the chemical properties of salt, and contain toxic additives, this salt is rich in trace minerals with piezoelectric effects. This salt is not heated during processing, and does not contain flow or anti-clump additives, and is ground using nickel-free grinders to prevent toxic tag-alongs. Contains a blend of solar-dried sea salts: pure Mediterranean sea salt, and pink Alaea Hawaiian sea salt.